A fort is no good without the guns to protect it. I ordered a couple of Eureka naval cannons. I found the gun carriage a little small so I made my own. Comparison below, my prototype gun carriage is on the right, one of my garrision sentry figs give some idea of size. Satisfied with the prototype gun carriage I made another seven; they are all made of cardboard with wheels made from some soft plastic rod on brass rod axles. While the main body of Monrovian army was advancing into Upper Belgravia, the commander of the allied Saxe-Jarlsberg and Hesse-Limburger troops, Count Pottensdorf, was given the job of following up behind and securing the line of march with garrisons. The commander of the Wittenberg Corps of Observation in Upper Belgravia, General Waldebeck, had decided to try and get some troops together to threaten the Monrovian supply lines, he had called out the local militia and some garrison troops. The pulk of Uhlans he had at his disposal were despatched to attack the Monrovian's river crossing garrison. General Waldebeck, straddled the road into Werlendt with two companies militia and the artillery, holding his company of garrison troops in reserve. On one flank the militia run away from a charge by the Saxe-Jarlsberg infantry ..
Count Pottensdorf was pleased to beat the Wittenberg forces. This was a great morale boost to his troops as they had been lumbered with garrison and supply line duties. General Waldebeck, suprised at the effectiveness of the Saxe-Jarlsberg and Hesse-Limburger infantry retired northwards to try and re-organize his forces for another strike at the supply lines. Feel free to copy, use or adapt as you feel. Section widths, these depended the sizes of my hoard of bits of cardboard, the main gate section is 28.5cm, 2 side sections are 27cm. Bastions sections are about 25cm across. In order to try out the final look of all the sections, I decided to do the 'half-bastion' section. I used GW Goblin Green for the 'grass'ed parts and SuperQuick building paper Grey Rubble Walling (D12) for the stonework. I made a corner turn and a half bastion, so that I could set up for a siege scenario, with the fort/city walls in the corner of my gaming table. All sections made (for now ? ), I've stopped building as I'm suffering from 'fortress fatigue'. I'm now deciding on how to finish off the sections - to do the stonework I'll definitely be using some printed paper sheets. 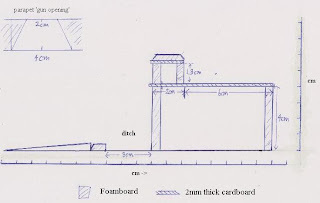 Dimensions - firing platform which is 6cm deep and 4cm high, 2cm wide and 2cm high for the parapet; 3cm wide for the ditch; with the glacis on the main gate section 5cm wide. The internal width of the main gate is 5cm. Out came my stock of glue, cardboard and foam board. Firstly I added the glacis to the main gate section, then the gate itself. I had great fun building the fort sections today but I am well tired now. I'm off to have a rest and relax (and possibly a snooze). 5. Sections to have firing platform(terreplein), parapet, ditch/moat and glacis (slopey bit at the front). 6. height of firing platform+parapet to be no more than 3". 7. section bases to be max of 6" deep and 12" wide. I've been hoarding thick card for some time, ready for this project. One source of card I find useful is the booards from old guide and road map books; books were stripped of the outer boards and the paper put out in our recycling bin. All the bases ready for construction, the fort overall is about 36" wide at the back, and approx 20" deep. More pics to follow as construction proceeds. To celebrate the 15th anniversary of the treaty of Witzend (signed in 1740) which ended the 3rd Belgravian War; the Household Troops pass in review before the King and the court. Firstly the Chevalier Guard and the Horse Grenadiers of the Guard, led by the combined mounted bands of the guard cavalry. These were followed by the Grenadier Guards and the Wittenland Fusilers (the Queen's regiment), led by the combined bands of the foot guards.